Bún Bò Nam Bộ (both the restaurant and the dish it is named after) was a favorite of ours - we ate there twice during our week in Hanoi. 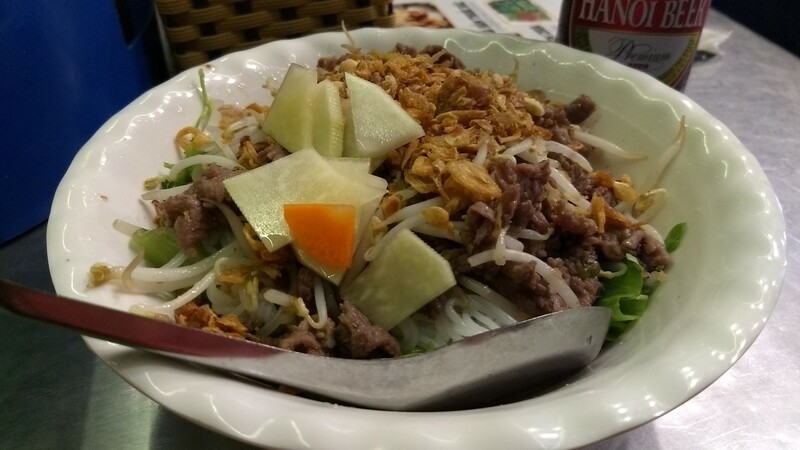 The name means "southern-style beef with rice vermicelli". The prep area greets you as you walk in the door, with a stir-fry station cooking up the beef and an assembly line for putting together the bowls. The dish starts with a bowl of greens topped with rice noodles. 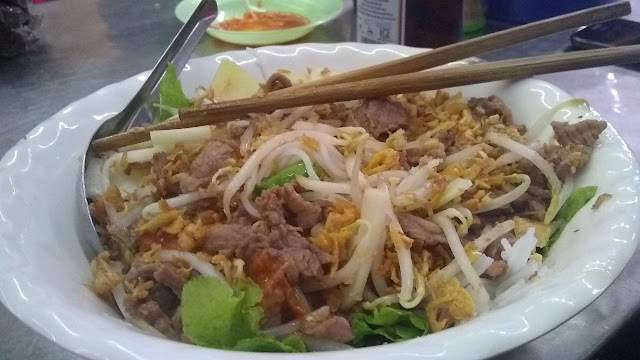 Then the beef is added hot out of the wok and the dish is topped with bean sprouts, fried shallots, peanuts and what I think were chunks of green papaya. 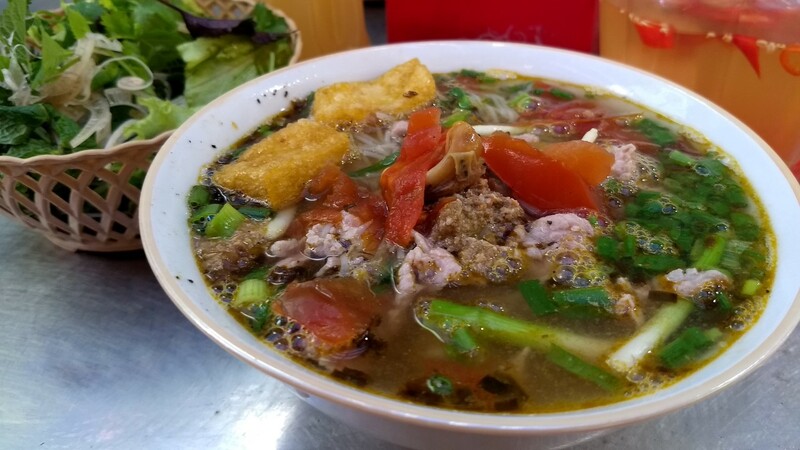 Once you stir everything up, it becomes an intense but surprisingly refreshing bowl of goodness. We will definitely be taking a shot at making this dish at home. I could see it becoming a regular part of our food rotation. 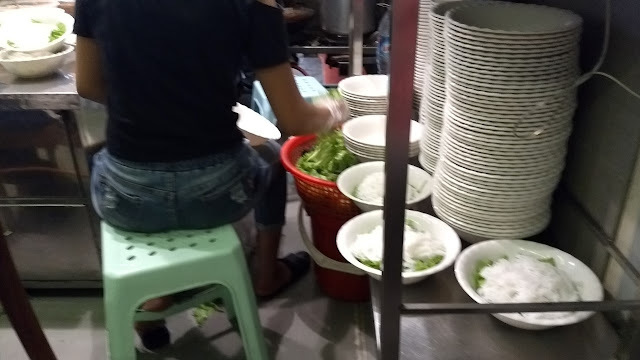 In contrast, one of our less successful meals in Hanoi was getting a bowl of Bún Riêu. 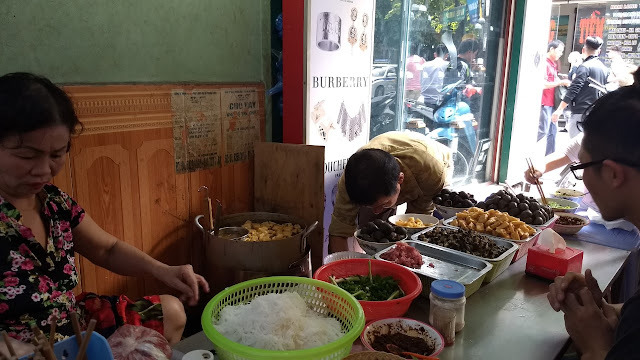 We stopped in at a little stall in an alley one day to give it a try. 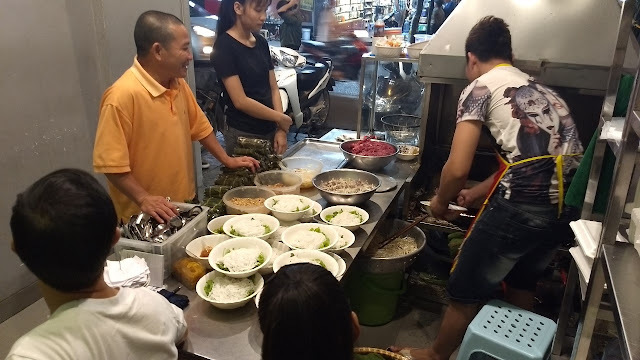 There was almost too much going on - a seafood-tomato broth, a big chewy snail, pork and tofu. Despite all of the ingredients, the flavors were quite flat. Not bad by any means, but no where near the standard of the other food we'd been eating in Vietnam.